Formax FD 8602SC strip cut shredder is a security level 2 machine that can handle up to 31 sheets of paper at a time in 30 feet per minute. It has a wide feed opening of 16” and can shred documents into ¼” strip cut pieces. A large waste bin of 33 gallons is perfect for this shredder as the strips take up more space in the bin than the cross-cut pieces. Formax FD 8602SC shredder not only shreds files of papers but can also destroy staples, paper clips and credit cards. The LED control panel of FD 8602SC strip cut shredder will give user the authority to operate the machine. It’s very simple and easy to handle. The control panel has automatic and manual start/stop functions, reverse feature, and indicator for informing user when the door of the shredder is left open or when the machines waste bin gets full. 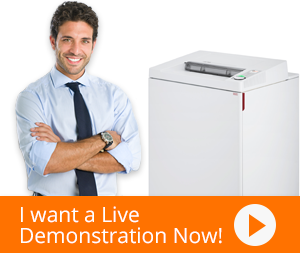 In case any of this happens, Formax 8602SC paper shredder automatically turns off. The Formax FD 8602SC is also equipped with a useful load indicator that also exists on the control panel. The sheet capacity level is displayed by the light on the panel and warns the user if the required number of papers has been exceeded. The manual function of the shredder is perfect for destroying small pieces of paper or films, which are usually difficult for the sensor to detect. In case of deteriorated performance, the user simply needs to press the reverse button for 5 seconds, and the motor will run in reverse for 1 minute clearing the blades of any debris that might be stuck to it. Formax FD 8602SC strip cut shredder also comes with the Self-Diagnosis System. It records shred information like operation time, number of auto reverse sequence and volume of paper shredded. Formax FD 8602SC strip cut office shredder has an all-metal chassis with casters for mobility.